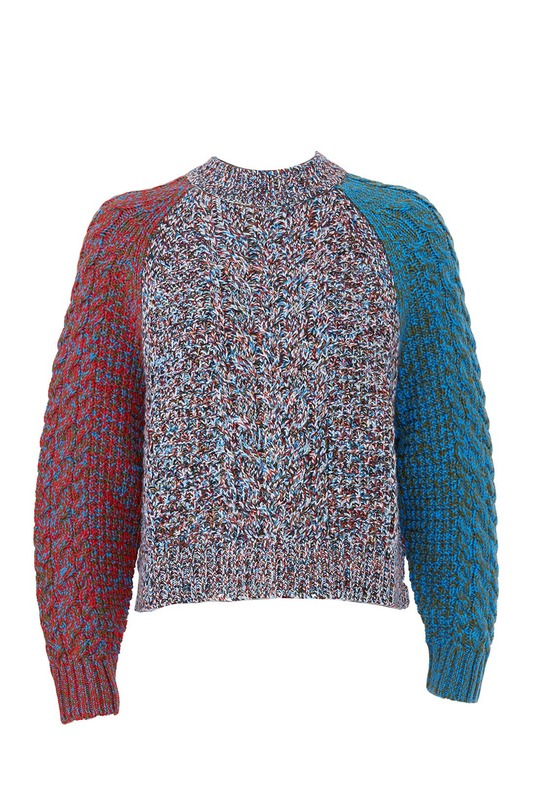 A color-blocked design gives a contemporary-cool look to this texture-rich cable-knit sweater from Jil Sander Navy. Cozy, fall sweater. Rent for crisp weather to stay warm! 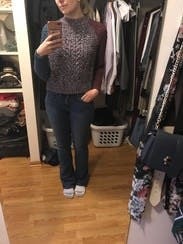 Really comfortable and warm sweater! Got a lot of compliments. Warm, soft, fun stitched sweater. A little on the boxier side so I wish the back was longer than the front. Lots of compliments. True to size. 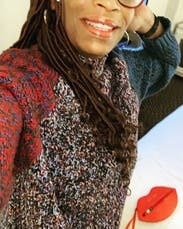 I loved this sweater! The colors and patterns were beautiful, but it was too big to be flattering on it. I would probably rent it again in a smaller size. I loved this sweater so much that I considered buying it! Beautiful cropped sweater. I'm 5'4 and it was the perfect length. Colors were beautiful. Loved! Beautiful, soft, cozy sweater. This felt like a blanket enveloping me with its love! It was almost too warm and I started to get hot towards the end of the day. Love this piece. Loved this sweater! I already wrote a great review that was lost in the eather so you get this one. Fit great, not at all itchy, heavy but breaths. RENT IT! The colors on this sweater are beautiful; even more so than they look in the picture. It is very heavy and great for a cold day. It's nice and soft and not itchy at all. But it's so short. The neck was tight, too. I think it shrank. Cute, but I would size up if I rented again. I wore this multiple times. The fit and color and warmth is top notch. True to size and extremely comfy but stylish. A little too boxy and colors weren't so flattering on me. 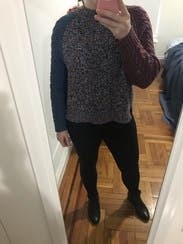 This sweater was really cute and fun to wear. Not a crop top, but comes right to the top of low jeans. So some midriff might peek out now and then. Coker's are fun. I wore red jeans. If you want to buy me an extravagant gift - this would do! I absolutely LOVE this sweater. It's boxy with wrist length sleeves and a bit of swing so I paired it with a ruched tank underneath and skinnies. So many compliments! I wore this sweater 6-8 times easily because I love it that much. One of my favorites! This sweater received many compliments and stares. The sweater fit was perfect. The quality was amazing. I was very satisfied with this choice. I wore it with jeans on the weekend and with a leather skirt to work!! 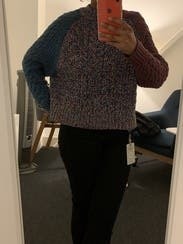 A tad casual for work but great casual sweater and loose fit is very comfy. It's definitely cropped, but I have a short torso so it worked. Overall great rental! The style cut laid very nice and the fit of the sweater was perfect - not too snug. 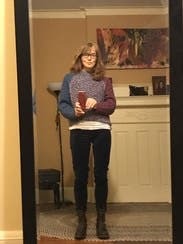 Very cute and comfy sweater, will rent again! Couldn't wear it out of the house as it was so large. Extremely large. I did like the material and would have loved it had it been a better fit. It a bit wide but cozy and perfect for a day in city shopping. 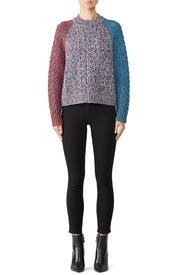 I wasn’t initially 100% in love with the colors/heathering/colorblock scheme of this sweater but oh my goodness the material and cut are so amazing! It is HEAVY, and so soft, just really great quality. It is fairly short, but I found it to be proportioned really nicely with the wider cut (especially at the back, it is nice and swingy) and that weight of the material helped it drape and hang really solidly. In terms of the length, it probably wouldn’t work with low-waist jeans without midriff exposure, but with jeans and pants that hit about at the navel and it also looks great with a pencil skirt. I love this sweater! It is soft and comfortable with a boxy fit that hits right when paired with high-waisted jeans. It is also luxurious and interesting. The winter is really dragging out here and it was great to get something colorful and fun to continue to endure the cold. This sweater fit nicely and is very cozy. I got many compliments. However it is pretty short in the back for my taste and I felt like I need to wear something underneath to cover my behind. Wouldn’t rent again. A beautiful thick knit that is not scratchy. So warm and cozy, but still stylish. I loved it! Cute with jeans and boots for weekend wear. Nice chunky knit. 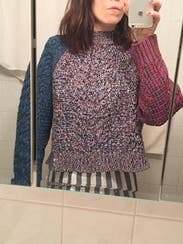 Oversized sweater that I wore in a small but really shouldve taken an XS due to small frame on top. I wore this sweater in Europe in November and it was perfect. Very thick and warm. The neckline comes up a little higher than expected, but I loved it. I thought it was very flattering and received lots of compliments. Love it. Lots of compliments. I would love to knit this pattern myself. It looks and feels hand-knit. This is a big boxy sweater that won't fit under your coat but considering how warm it is, it won't need to. 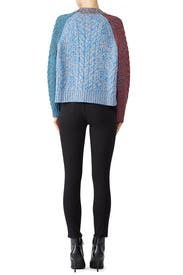 The colors are gorgeous and the sweater is really lovely to wear. Recommended if you have a weekend by the fire or some other casual thing to wear it to! Sweater is pretty baggy, even in the size I usually wear. It is incredibly warm and cozy and I love wearing it! This is an oversized style sweater that is true to size. The yarns are multi colored which you notice more the closer you get to the piece. 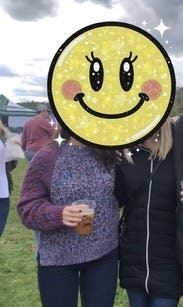 I'm tall and also DD cup size so this felt a bit short on me. Not the most flattering sweater for a thin torso with a large chest since it creates that tent effect- but any sweater this style would have that effect. Just something to think about if you're conscious of looking a tad heavier or slightly more top heavy. 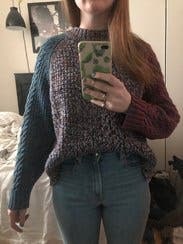 For anyone wanting to disguise a little extra in the mid section, this would be a great sweater for that. Will be wearing with high waisted pencil skirt or high rise denim. A regular rise would potentially show skin at the side vents and for sure show skin if I were to raise my arms. Very soft and comfortable. Love the multi color detailing. Very warm sweater perfect for weekend errands in February. I'm 5'9 so this was a slightly cropped fit on me. Cute, boxy, chunky sweater. This is a really good item for making something casual feel elegant and put together.